Printed Stubby Holders & Custom Stubby Coolers. Stubby holders are great way to say thanks to your staff or clients then look no further than our range of completely custom made stubby coolers and drink holders. All available printed with your companies details and can be made to suit any size beverage. Bottle coolers and can coolers are all CMYK digital printed in full colour and can be delivered in as little as 10 days from order approval, so reach out to us today and request a quote, just tell us your preferred quantity and any print requirements and the team will draft a no obligation artwork mockup and a firm written quote. 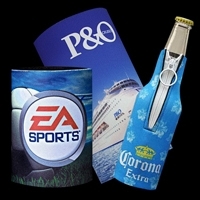 From Sydney to Perth, one of the most popular commercial gifts nationwide is the individual promotional stubby cooler. Emblazoned with your company name and logo, they are the perfect advertising method for any business. Dynamic Gift has a wide range of these useful, versatile products, allowing you to promote your enterprise to the public through free, branded items that act as miniature billboards. From the pub to the park, these products will be cooling beers, soft drink and more, keeping your clients happy while showing off your custom commercial design and improving overall brand awareness in a wide range of locales. Throw out at events and functions to people as a thanks for coming gift. As part of a bigger marketing bundle of gifts such as a hamper. If you own a pub or a local attraction you can sell them as souvenirs. Sporting clubs can co brand with a sponsor and share the cost. As above if you are a business you can co brand with a sports club and donate them to the club for spreading awareness of your brand. The flat pack design stubby cooler which folds completely flat for mailout giveaways, they also stow away easily in peoples cupboards and draws for use later. The full colour stubby cooler with base is an excellent, affordable yet premium feel item which features 5mm neoprene with option to upgrade to 7mm neoprene. Our reversible option is also available if you just can’t decide what to print and need the extra print real estate. By choosing a style that fits in with your brand, you can hand out these gifts at a range of events to increase corporate exposure. Once the public gets a hold of these items, they are almost guaranteed to use them. We have worked hard so that you can obtain your requested promo goods in rapid time. With our own manufacturing facilities, you can make the choice to buy our goods with confidence that everything will be produced without delay while we keep a close eye on quality and output. We promise to deliver our stubby holders to your door no matter where you live in Australia (although delivery times will vary depending on distance). In this way, you can make use of these tailored commercial gifts no matter where your company is currently located. As our beverage coolers are so versatile in their manufacture, you can adjust the colours, patterns and images so that they reflect positively on your company. Our goods can be personalised with a little help from our design team so they provide the right impression to anyone receiving them. We can provide 3D virtual models for you to browse over before manufacture and offer bulk rates to make our products even more appealing. These neoprene designs can be modified through sublimation printing for full colour images that match your commercial branding initiatives perfectly. Dynamic Gift can help you widen your marketing opportunities through our range of top quality promo merchandise. Our printed beverage coolers are an effective way to garner positive attention for your company and can be used both indoors and outdoors by those who want a refreshing drink. Thanks to our wholesale rates, you can order a large shipment of these for your organisation and hand them out to the community to improve satisfaction and increase brand awareness. With cheap prices and superior quality, you can trust in Dynamic Gift to provide you with commercial gifts that really deliver results. Highly quality products don’t need to take forever to be made, our range of promotional stubby coolers can be produced and delivered in as little as 5 days with our optional rush service. If however your deadline isn’t for a while then we can offer some extremely competitive pricing on longer turnarounds and offshore production which enabled businesses of any size to promote their business to the world! We are on standby to assist with your marketing efforts, don’t delay! Contact us for a no obligation quote and a 100% free virtual sample of your stubby holders prior to production.